Secrets of priests and temples - revealed at last! Who are the priests your player characters turn to for cures and healing? What is the temple like where they line up for holy water? What is the patron church for the zealous party paladin? Where did your party's clerics and priests train, and where do they go when the time comes to learn higher mysteries? 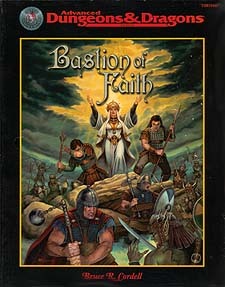 Bastion of Faith has answers to these questions and many more! * The full story behind the Bastion's "Secret Doctrine" and the consequences for the temple should the truth ever get out! For Dungeon Masters and players of all levels.